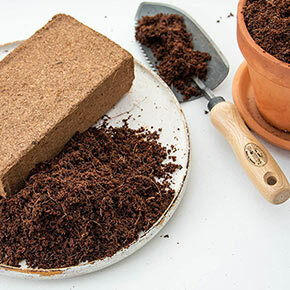 Poor soil can cause a host of problems for your plants—compacting soil suffocating the roots, lack of access to nutrients for the plant to grow, poor water retention… The coir brick can help with that. When it arrives, it's light, about the size of a brick—easy to carry and store. Soak it in water, it'll expand to about five times that size. You can use coir alone or amend your garden soil with it to help with aeration, water retention and delivery of essential nutrients. It is a good, eco-friendly alternative to peat. Coir is compacted fibers from coconut husks, which we get as a natural biproduct from manufacturers in the coconut industry. It's a pH neutral, totally natural medium. If you use coir without mixing in soil, you'll want to add fertilizer—coir doesn't have a nutritional component. 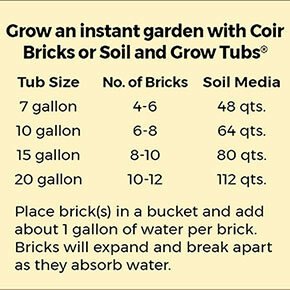 1 brick takes about 1 gallon of water to expand to its full size. Each brick expands to approximately 0.12 cubic feet or 3.2 quarts of media.